Please note: It is advisable to test on an inconspicuous area prior to use. It is advisable to wear protective gloves when using Leather Ultra Proofer. Use a clean, soft, lint free/microfibre cloth to apply Leather Ultra Proofer. It is best to apply small amounts at a time and work the product into the leather with firm circular movements. When a manageable area has been covered with Leather Ultra Proofer, use another comparable cloth to polish/buff the leather and remove any residual product that may remain on the surface. 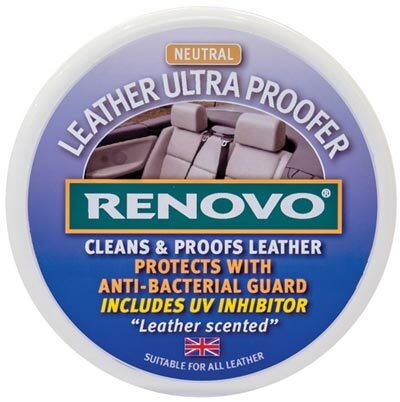 Avoid allowing the Leather Ultra Proofer to come into contact with internal grills/speakers, carpets, head linings and any other areas from which it may prove difficult to remove this product.